← Can A Fixed Mindset Be Changed? I can’t explain the learning that has been happening in my classroom lately. All I know is that it’s cool. Maybe after reading through this post, you can help to explain it and make meaning from it by providing another perspective. An interesting dialogue has begun to develop between my students and Dave Tamblyn, the Director of our school board. 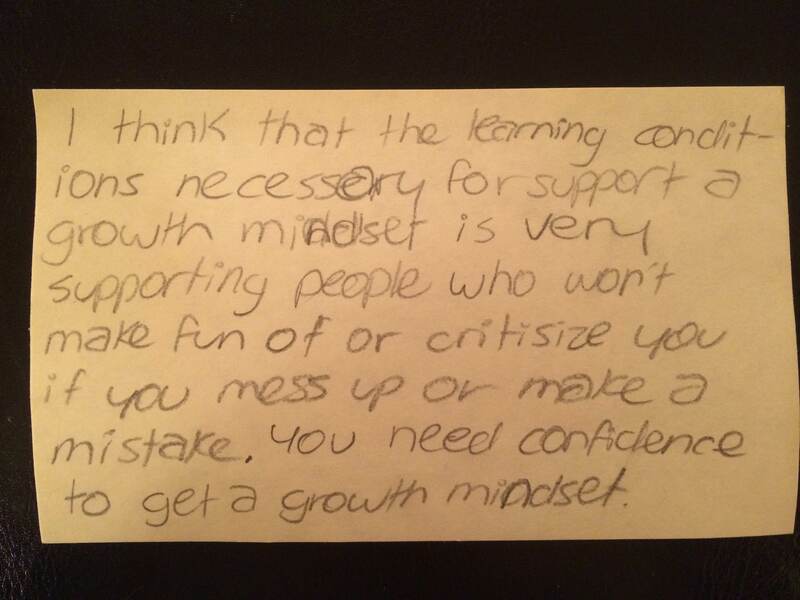 What started as a simple post to help curate the events from a Leadership Learning Team meeting, has turned into a series of connected questions and responses regarding growth mindset, fixed mindset, and conditions for learning. **note: Dave’s comment was anything but brief. 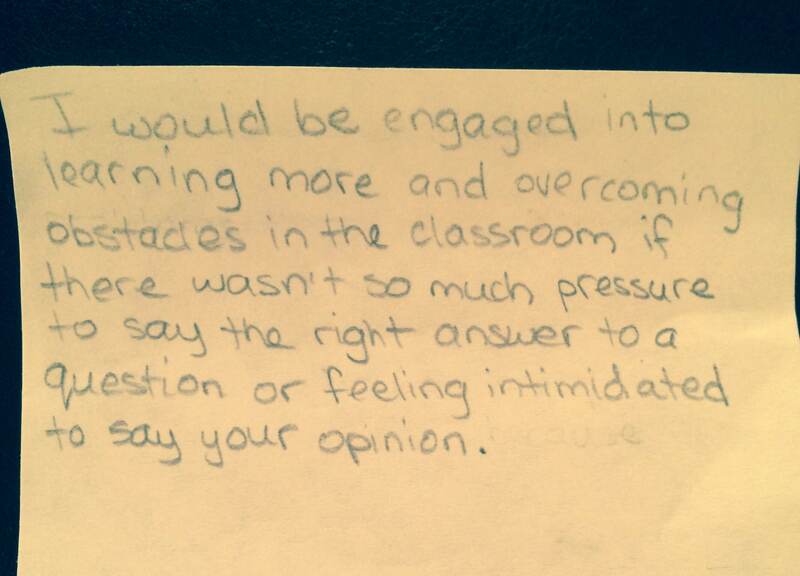 When my classes read his thoughtful reflections on their ideas, something very meaningful happened. Right away, they asked for some sticky notes so they could write down their opinions, which they knew I would use to create this blog post. I find that the subject I struggle with having a growth mind set the most in is my university functions class. Although my marks are still satisfactory I find this year I am struggling to come to terms with new concepts. I also noticed I enjoyed my math class more last year when most of the curriculum was expanding on concepts already taught in grade nine. This year however most of the information is new to me, and I am having trouble coming to terms with the direction the curriculum has [taken]. In order for me to improve my mind set in this class I need to do a series of things. The first, is to remain positive. If I believe in my strong math background I know I will be able to overcome my lack of confidence when facing issues that make me feel defeated and unmotivated to learn anymore. The second, is to ask more questions. I need to stop being afraid of the possibility of being incorrect, and voice my questions and concerns to not only my teacher, but my peers. Today in class we earned about the idea of not being naturally good at something, or having a bit of talent, but working and practicing at it to become better. This can really relate to anything in life, classes of all types, jobs, the list goes on and on. Thank you to my students for their willingness to provide such honest insights. It takes courage to share your thoughts with others, so let’s hope that these posts can be our first steps to even better learning together! 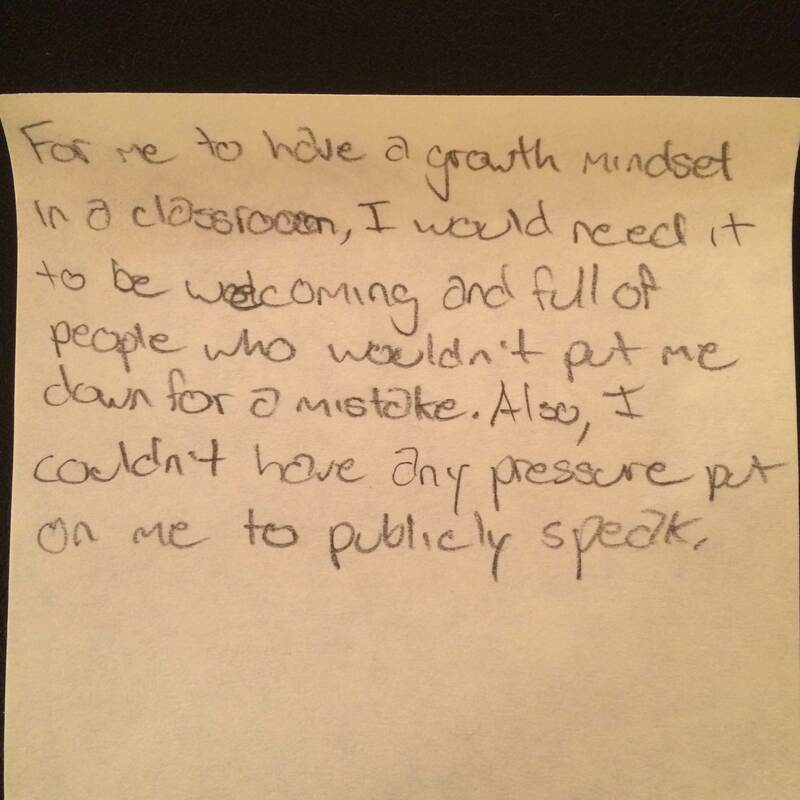 This entry was posted in Education, Education Reform and tagged conditions for learning, growth mindset. Bookmark the permalink. I think there all same. No matter what people don’t want to be judged for getting the answer wrong. I think what the other student’s said was true, about it being difficult to change your mindset, especially while remaining positive.